At about 09:30 our ship stopped for our excursion of the day by small wooden flat-bottomed boat up the Shennong River through the famous Lesser Gorges - Mianzhu Gorge, Yingwu Gorge & Longchang Gorge. After a ride of about an hour on a smaller cruise boat, we all disembarked onto the small wooden boats, each taking 10-12 people. 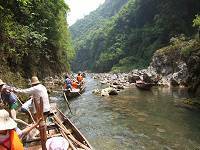 This boat journey takes about one hour with the 4 boatmen punting with their wooden pole upstream at the front of the boat through lovely greenery & hills on either side of the river. The famous part of this tour is about the last 15 minutes of the journey where the river becomes very shallow and rocky, The trackers jumped out of the boat to pull it upstream using ropes, a very hard task. Traditionally, they would have perfomed this task naked, as their rough water soaked clothing would have chafed badly. Nowadays, the boatmen prefer to wear clothing due to the many female travellers. To give them more strength for the job they began to sing their rural songs as they carried out the hard manual task of pulling our boat in the shallow water. It was very touching as the sound of their songs resembles a wild animal howling. When all the boats had been pulled to the turning area I asked a few of the boat trackers about their work while they were having a rest. They only do it once a day as the physical strength demanded from them is huge as I saw myself. They are all local farmers doing this for extra income for their families. They get paid about 35 Yuan per person which is about £3 or $4 for their 2 hours of hard physical work. The trackers ages vary from mid-twenties to fifty plus. The boat journey on the way back was much easier of course, with the river running down stream. Our boat guide sang us a local mountain song followed by our boatman who also sang us a lovely local song. We returned to our cruise ship for lunch. There were various demonstration of Chinese Embroidery Paper cutting etc in the afternoon. By 3:00pm we entered the third Gorge, The Xiling Gorge. This is the longest gorge at 80km long. 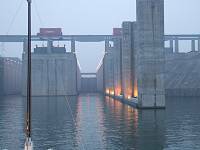 At about 7:00pm we arrived at the massive Three Gorges Dam with its imposing walls for the entrance to the ship locks. It takes about 4 hours to go through the total of 6 locks - each with water level fall of about 20 metres. After the last huge lock door opened we headed downstream a further 30km to moor for the night. Through the early mist of the Yangtze River next morning I could see a traditional Chinese temple with yellow roof tiles on the quayside. It was a lovely sight for arriving at a new town. This morning's excursion included a tour around the Three Gorges Dam Site. 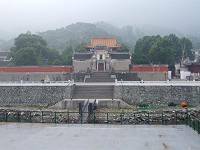 Unfortunately the early mist on Yangtze River prevented a clear view of this important site. We had a 2 hour quick tour & were back to the ship by 10:00 for sailing. We entered Eastern Xiling Gorge by 10:30 & about an hour later we entered the ship lock of the Gezhou Dam. We were lucky as there was no queue we went through quickly. The rest of the day was spent on the ship with various activites in the afternoon & the evening. Next morning we rose with the rain hitting down our cabin window. It was a wet day to arrive at our last stop, Wuhan. After breakfast it was time for everyone to settle their bills. Our luggage had to be ready & outside our cabin door by 10:00am. Afterward there was a long wait until we arrived at Wuhan port at around 01:00pm. The rain had not stopped. We were out quickly with a porter carrying our luggage all the way from the ship through many steps up to our waiting car on the main road. I was impressed by this good service. Our local representative, Ms. Guo & a female driver were waiting for us. Since our next flight to Chengdu was several hours later we visited the Hubei Museum & Chairman Mao Zedong’s villa. Unfortunately due to extensive renovation of Mao's villa it was closed to visitors. The villa is situated in a lovely environment with lake & trees. Chairman Mao loved to come here for his summer retreat. We had a few hours spare before going to airport so we headed to town to one of many western style cafés for a rest. 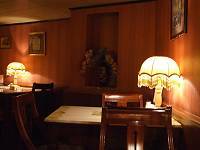 Like many western style cafes, this one seemed to have a very 50's-style decor. 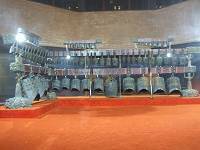 China only remembers the western style dating back many decades, with many new buildings & hotels built in this style. It is very charming. We arrived at wuhan airport in the late afternoon for our flight to Chengdu. Unfortunately China Eastern Airlines flight had been delayed several hours due to bad weather. We arrived at Chengdu & checked in at the lovely 4* Tianfu Sunshine hotel about mid-night. We are using this elegant & spacious 4* hotel as our Superior hotel in Chengdu. Next morning we got up early for our early morning flight to Lhasa, Tibet.